ABSTRACT: During the British colonial days, Hong Kong’s system of governance was usually described as an “executive-dominant system.” When crafting Hong Kong’s post-colonial political order in the 1980s, the Chinese leaders decided to maintain this executive-dominant style of governance in the HKSAR. Nevertheless, in spite of a wide range of constitutional powers conferred upon the Chief Executive by the Basic Law as well as the installation of a pro-government majority in the Legislative Council, unlike its colonial predecessor, the HKSAR government struggles to maintain its dominant position vis-à-vis the legislature over policy-making. This article attributes the dysfunction of the executive-dominant system after 1997 to Beijing’s resistance to the development of party-based government in Hong Kong. By marginalising political parties in the organisation and policy-making process of the HKSAR government, the executive and legislature have become disconnected since 1997, and the coalition between the non-partisan Chief Executive and pro-government parties remains fragile. In order to get Hong Kong out of the existing political quagmire, the development of some form of party-based government in Hong Kong is a critical issue that the Chinese government and the HKSAR government must confront. KEYWORDS: Executive dominance, executive-legislative relations, legislative success rate, Hong Kong. ABSTRACT: The Hong Kong SAR government has always been proud of the fact that Hong Kong retains its top ranking in terms of “market freedom” according to most international rating agencies and think tanks. What the government has been much more reluctant to recognise is that, more than 15 years after the handover, Hong Kong now also tops other developed economies in terms of income inequality. The growing inequality is caused, among other things, by worsening poverty among the aged. 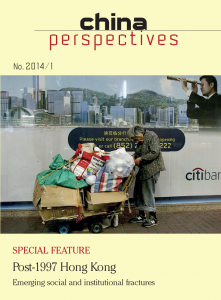 This paper attempts to provide an updated analysis of income and wealth polarisation in Hong Kong, with a particular focus on the retirement protection policy and old-age poverty. It will examine the polarising effects of the financialisation of the Hong Kong economy. KEYWORDS: Financialisation, asset-based welfare, pension fund capitalism, public housing, retirement protection, income polarisation, old-age poverty. ABSTRACT: Existing research shows multiple articulations of national identity by Hong Kong’s people since the handover in 1997. An issue of contention is whether the dichotomy of China as the “other” vis-à-vis Hong Kong’s local identity still prevails in the context of top-down renationalisation and new developments in transborder spatiality. While the existing literature has illustrated Hong Kong people’s steady growth of pride and affinity for national symbols, re-examination of three representative surveys (2006, 2008, and 2010) demonstrates that resistance to these cultural icons is also growing. Furthermore, while previous studies have revealed that a “cultural-economic China” is more welcome than a “political China,” the three surveys mentioned above indicate that even the former is meeting growing local resistance. The otherness of China hence should be re-visited in light of the ambivalence of Hong Kong identity. The theoretical and social implications of this sense of the otherness of China are also significant. Specifically, this article argues that the ambivalence of Hong Kong people’s articulation of national identity is closely connected to the uneasiness generated by encounters between China and Hong Kong in recent years: controversies and contentions arising from national education, the transborder flow of population, and the provision of goods and public services for non-locals. In this paper, I shall look at the development of local and national identities in some states of contested equilibrium. KEYWORDS: national identity, China, Hong Kong, local identity, renationalisation, contested equilibrium. ABSTRACT: There is a missing piece in the puzzle of social development in post-1997 Hong Kong: regional and national integration. For a long time it was envisaged that while Hong Kong would remain relatively secluded from the mainland, it could seize the opportunities, evidenced in the massive relocation of manufacturing plants to the Pearl River Delta since the mid-1980s, presented by China’s economic reform. However, before long, with the deepening of China’s market reform and its emergence as a new economic power, Hong Kong was caught unprepared for its integration into the motherland. Growing tensions between mainlanders and Hong Kong people have already received considerable media attention. But what has somehow escaped people’s attention is that the expected opening of new opportunities for Hong Kong people on the mainland has not fully materialised. In this paper, we shall look at Hong Kong’s current status in realising the expected opportunities to be created in the process of China’s economic development and Hong Kong’s further integration into the process of national development. Drawing upon official statistics on Hong Kong residents working in mainland China, it is suggested that, instead of seeing more Hong Kong residents finding the mainland to be a newly developed environment for career development, the trend has reversed. KEYWORDS: regional integration, economic integration, manufacturing relocation, “China opportunity,” Hong Kong residents working in mainland China. ABSTRACT: The Church of Jesus Christ of Latter Day Saints – the mainstream Mormon Church – has been seeking to establish itself in the People’s Republic of China since the 1980s. Unlike other religious movements of Christian and foreign origin, which have chosen to go underground, the LDS Church has adopted a strategy of complying with the law and negotiating with the state to obtain official authorisation to conduct its religious activities. The aim of this article is to describe and examine the basis, the form, and certain observable effects of such a strategy, both on an institutional level and in terms of the religious identities that are produced. KEYWORDS: Mormonism, China, the state, inculturation, religious market, regulation, distinction, identity. ABSTRACT: As a result of China’s increasing presence in Africa, Chinese urban development projects are increasing in number in the continent’s cities. In Nairobi, Chinese development aid and state companies are helping to build road infrastructure. Chinese property developers, who are for the most part private, are building and selling housing for the middle classes. Urban projects being carried out by public and private Chinese players are helping the development of the Kenyan capital and the exportation of Chinese urban planning and design practices to Africa. They represent a vector of the power of attraction of China. This article sets out the results of a field study. KEYWORDS: China-Africa, South-South cooperation, town planning, housing, infrastructure, urban planning and design practices, globalisation, Kenya, Nairobi.